Designer Ashraf Valliani is based in Reston, Virginia USA launched her brand Heritage Collection by Ashraf Valliani in 2010. Ashraf Valliani specialize in fashion forward fusion wear for the woman of today. 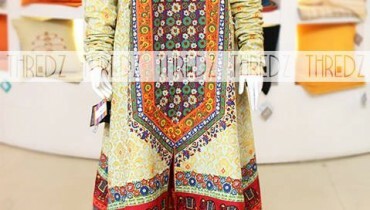 Heritage Collection by Ashraf Valliani designer label is solely dedicated to women’s outfits. Her pret-line is pretty popular amongst the working women who want to retain their casualness along with a touch of glamor and style. Make this Eid all about fun & all about colors, Different panels & textures combined in beautiful shades to make you look chic & trendy, As classy & trendy as it gets, White looks GORGEOUs with block printed maroon dupata and an array of worked borders and a hint of black..Smart-casuals and formal evening wear are includes in this eid outfits. Lets have a look at Ashraf Valliani latest Eid stylish outfits with price details for Heritage Collection, casual and Party Wear Collection 2013 Ready to Wear Women & girls fashion outfits Collection by Ashraf Valliani.